With the start of the US Open just a week away, I wanted to pass along some info from SeatGeek on what we’re seeing on the ticket market for the tournament that I thought could be relevant for your program. 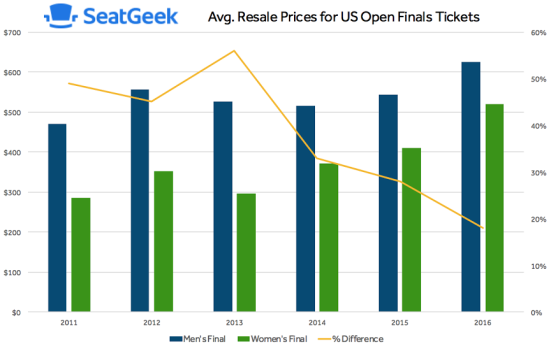 At an average resale price of $520, tickets to this year’s Women’s Final are the hottest SeatGeek has seen since the company began tracking the secondary market in 2011. That price point tops last year’s record-setting ticket of $409 by more than 25 percent. In addition, that also means the gap between ticket prices to the Men’s Final and Women’s Final is smaller than ever before. Men’s Finals tickets have resold for $624 on average this year, meaning the percent difference between the two is 18 percent, compared to an average of nearly 40 percent. The largest gap occurred in 2013, when the Men’s Final more than doubled the Women’s, at an average resale price of $526 to $296. Click here for a full schedule of matches. The increased demand to attend the Women’s Final might be due in part to a “Serena Effect” – while there is no guarantee she will make the US Open Championship, especially after an early Olympic exit in Rio, she does hold 22 Grand Slam singles titles and has won three of the past four US Open titles. All data above is captured at three weeks prior to the date of the Finals, therefore removing any pricing fluctuations that might occur during the tournament as players win and lose (and making it an apples-to-apples comparison for dates). Interested in attending any of the US Open matches? | Need to sell your US Open tickets?